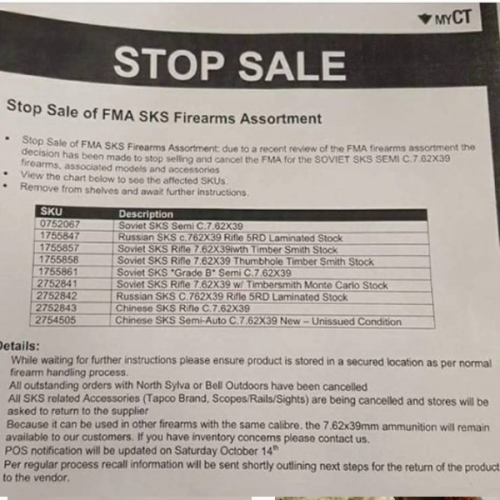 Canadian Tire has ordered the stores to return all in stock SKS rifles. Maybe Dan will know something??? Sounds to me like this would be prime time to contact North Sylvia and Bell Outdoors for a deal on one. That is, assuming they don't insist on only dealing with retailers. I've seen SKS going for as low as $199 from the likes of Cabelas. Given the unexpected change in plans from Can Tire I have to wonder if these distributors would be willing to dump them for a dirt low price. If so, I'm in. They covered over Savage Arms logo because it offended someone. They said SKS could go full auto. So they pulled them. Now pulling them, so probably some political BS. LOL - oh no!!! SAVAGE Arms. What a bunch of savages, they are. More important Home Depot is just sold out of PVC pipe and shovels. Home Hardware still has some in stock. Boating accidents seem to be on the rise too. Not sure what the date on that letter is but my local CT had over a dozen sks's on display yesterday when I stopped in for DEF fluid. Its dated to go into effect today. Might just be corporate stores, though I would think the franchise stores would not be able to get more if corporate stops selling them ?. Will have a look next time I'm into town. Can't resist a stroll through the gun section while I'm there. Thanks. There is a good thread going on on this issue at CGN here: https://www.canadiangunnutz.com/forum/s ... Tire-Soon-! For the uniformed Canadian Tire sold the crude BBQ paint special refurbs.Half the "included kit" is missing.They dumped their guns to Cabela's.Look around for a non-reburbed gun but expect to pay around $300 nowadays.By the case turned out to be a sound investment. Well the distributor is North Sylvia. CT wouldn't be able to dump them. It would be pull from CT, then re distribute to Cabelas. Doesn't get much greasier than North Sylvia............Cabelas ended up with the guns is what I heard on CGN.Badly pitted re-finished parts guns.I picked up a 57 that showed no caveman handling with a blued bayonet nicely done from another source. Minty with full kit. Some idiot turned his[ firing pin frozen ]SKS into the RCMP after firing copious amts' of corrosive ammo and not cleaning it .......guess what it slam fired full auto.This is why SKS's are now in the Gov't crosshairs. I used to own two SKS's. One Yugo and one Norinco, but sold them off. The Yugo was ok, but the Norinco would slam fire as many as four or five rounds at a time....it was very well cleaned too. Even though, down here anyways, we can still (yet) own AR's, AK's and the like, I sold my last AK off. I bought one of the Ruger American bolt guns in 7.62x39mm....have a lot of that caliber. The Norinco SKS, that had the slam fire problem, I sold to my FFL dealer and let him know about the slam firing problem first. He pulled the bolt and used a set of calipers on the firing pin hole, found it was way oversized. Needless to say, I took a loss on getting rid of that one.